I'm extremely late to the party, but I just couldn't keep my thoughts to myself. I sprung the topic on Jorge and we ended up talking about both series' legacies. Feel free to jump into the comments with your thoughts! IMO the best Star Trek game is FTL. Great cast as usual guys. Ick. 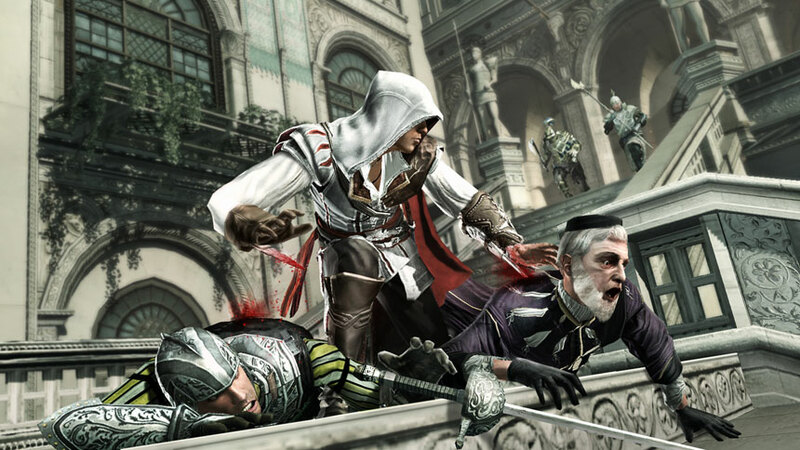 Other than the buddy-buddy time with Leonardo da Vinci, I VERY STRONGLY DISLIKED Assassin's Creed II. ...I actually don't really care for the entire series. I read the book the first game is based on ("Alamut" by Vladimir Bartol) in anticipation of its release way back when and was seriously let down; it tackled so superficially what the book did. Assassin's Creed is the Lost of the videogame world. (And I liked Lost). But, as always, excellent 'cast! Woah, I didn't know AC 1 was based on a book. Yeah, one of the best boring books I've ever read. How a Slovenian living during WWII came to write about 11th Century Iran, I'll never know. AC could definitely do with some more smoke monsters. In fact, I hope the next assassin chosen is an amorphous cloud of some kind. A little late to this discussion (and it's been a long time since I visited! Hello again! ), but I had to give this one a download considering I just finished Assassin's Creed 2 for the first time about two days ago and had the exact same reaction: why they hell did people like this? I literally felt like it was one of the most boring AAA games I have ever played. Only my completionist fury got me to the end. And the ending! I couldn't get over the striking similarities Mission To Mars, which was a very bad movie (i.e., a dark room filled with planets in which a glowing woman in a tall hat explains to you that a great disaster befell her kind and that it was her kind who "seeded you" -> http://youtu.be/PvISV0wGusU ). Don't get me wrong. I think the games have always been extremely impressive technical achievements, but I can't say the same for their gameplay. I've played two of them now and am still shocked at how NOT fun they are for all their acclaim. Like Scott, when I hear people complaining about AC3 or posting their frustration videos, it's just so much vindication. I mean, when I popped in the first Assassin's Creed game and learned that one of the mission types that I would have to do over and over and over again is to "go to lookout points", I was already annoyed. There is no purpose to these missions other than to just go to a place on the map and stand. This is terrible game design on the same level as RPGs that make you speak with every NPC in town before you can proceed. Or the missions that involved nothing other than walking beside an NPC for a while while they talked to you about something or other, and if you didn't keep up or moved too far away from them you failed? Literally, a mission where you just walk. What part of that is fun or even interesting? I mean, why not include a mission where I just wait in line at the DMV for a while? This is not exciting stuff. The only challenge to overcome in these missions is your own boredom. The one thing that WAS sometimes fun in Assassin's Creed but that I very rarely got to do was path finding. This is something AC has in common with games like Tomb Raider or Prince of Persia, but basically it involves knowing you have to get from point A to point B, but the path to get there is not straightforward. For example, there were towers in Venice that you couldn't just climb straight up like every other tower in the game. You had to climb up to a window, then crawl inside and climb up the inside wall, then climb back out the window and keep climbing up the outside wall. Tomb Raider and PoP have more twitchy controls and can do the fast-paced platforming type stuff millions of times better than AC, but the benefit of AC's "climb throttle" is that you get a greater variety of climb actions due to their being context driven. A game with AC's tech and control scheme should focus on navigation, not twitch platforming. 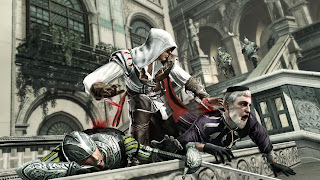 Ezio is essentially a "sticky" or "clingy" rag doll with a button that turns his magnet on or off. You turn on the magnet and just kinda roll him over stuff. How do you make that fun? I'm sure there are ways, but Assassin's Creed doesn't do the best job of finding them. After reading your "clingy/rolling Ezio" description, I started thinking of an AC + Katamari mashup. It's also worth noting that my wife and I are trading the controller back and forth while playing Brotherhood and we're both of the opinion that it's a much better game. The missions are more varied and have multiple success levels, so if you fail one part you don't restart. The combat is more fluid. The controls are still a bit wonky, but the city is set up to better facilitate the way Ezio moves. Hell, the game even looks better in terms of color and texture detail. I'm starting to think that people have basically transposed their feelings on the later games to the earlier ones. Man I hope it's better for real. I'd still be reluctant, though, because I didn't like AC1 and the only reason I tried AC2 is because I was told it's better than one. I'm scared to believe, Scott! In case you're stil following the thread: several hours in, my opinion of Brotherhood is essentially the same as my opinion for AC 2. The presentation, mission variety, and level design are improved, but dumb instant-fails and a general sense of busy work make for a mediocre experience. As the game has progressed, more "walk and talk" and instant-fail missions have appeared. Also: they somehow managed to cram in a very poorly done turret sequence. It's like a case study of trite design! EXP Podcast #207: Your Favorite Things of 2012!